Have economic times gotten so bad that some of the dead are going unburied? Several large counties across the country are experiencing unprecedented increases in the number of unclaimed deceased  not only the dead people who could not be identified, were indigent or were estranged from their family, but also apparently the growing number whose loved ones simply cannot afford to bury or cremate them. The phenomenon has increased costs for local governments, which have to dispose of the bodies. "People were picking the bodies up last year," says Albert Samuels, chief investigator at the medical examiner's office in Wayne County, Mich., which includes Detroit. "Across the board, I'm finding the numbers are on the rise of either families who are not coming forward to claim bodies or they're signing releases saying they can't afford to bury someone, which taxes the county resources because then the county is responsible for burying these people." The Los Angeles County coroner's office has seen a surge in the number of bodies not claimed by families for cremation or burial because of economic hardship, according to the Los Angeles Times. At the county coroner's office  which handles homicides and other suspicious deaths  36% more cremations were done at taxpayers' expense in the past fiscal year compared with the previous year, 712 vs. 525, the paper reported. The traditional tourist mecca of Las Vegas is facing similar challenges. The coroner's office in Clark County, Nev., which includes Las Vegas, saw a 22% increase in burials and cremations of unclaimed bodies this year, jumping from 741 to 904. When burial costs exceeded $1 million in the 2003-04 fiscal year, the agency turned to cremating the unclaimed unless it could be determined that burial was required because of religious or other beliefs. 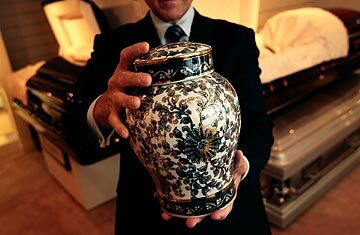 Each cremation costs $425 to $475. Currently in Detroit, says Samuels, "I have approximately 65 to 70 bodies that are ready to be buried. Of those 65 or 70, I can tell you, are 35 or 40 where families have signed off on the bodies and they don't have the funds to bury them." It costs the state  or the county, if the state declines to help  $750 to bury an unclaimed decedent in a potter's grave in Western Wayne County. That is still only a small fraction of what a traditional burial costs a family. (According to the most recent statistics from the National Funeral Directors Association, a regular adult funeral with burial, not including cemetery, monument or marker costs, averages $7,323.) Even so, the costs can quickly add up for a place like Wayne County. "Per capita, we're probably the fifth busiest medical examiner's office in the country," says Samuels. "We handle 13,000 death calls a year, and almost 3,600 bodies come through this system a year. So you're talking about 10 bodies a day, average." Despite the considerable costs to his agency, Samuels is sympathetic to the plight people find themselves in. "They don't do this gleefully. These people are really heartbroken about the fact that they can't [bury their loved ones]. This is not just a distant relative  you have kids who can't bury their parents a lot of times, or siblings who can't bury each other."